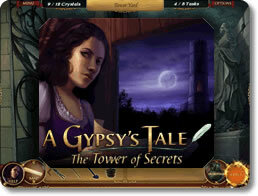 A Gypsy's Tale: The Tower of Secrets Game - Download and Play Free Version! 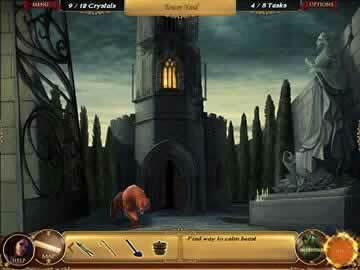 A Gypsy's Tale: The Tower of Secrets is an entertaining and intriguing new Hidden Object game that will see gamers enjoy hours of fun while they struggle to complete the game's challenging puzzles. The fun begins after Reylin of Winderalth is hired by a mysterious monk and is charged to rid the forbidding Tower of Secrets of a malicious curse, and players get to follow - and help - Reylin as their champion faces hurdle after hurdle. Sent deep into the wilderness to face the nameless evil that has cursed the castle, Reylin has no choice but to negotiate a confusing maze in order to unlock the sinister secrets, and, on the way, to confront witches, gnomes and ghoulish ghosts. Jars of fireflies, rain books and enchanted paintings are also just a few of the intriguing objects that Reylin has to deal with before the corrosive curse can be cracked. 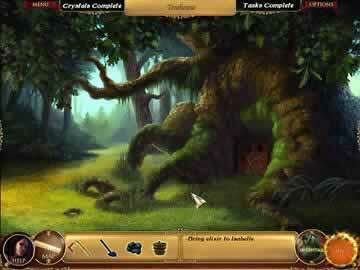 With darkly enchanting graphics, deliciously complicated puzzles and creatively creepy game locations like the Dark Forest and the Haunted Cottage, A Gypsy's Tale: The Tower of Secrets promises to become a popular addition to the pantheon of hidden object games that are presently available for the avid gamer to download.